09 Oct New Water Invests in Leading Frozen Food Innovator The Perfect Bite Co.
An affiliate of New Water Capital L.P., a Boca Raton-based private equity firm focused on lower-middle market companies, announced it has made a growth capital investment in The Perfect Bite Co., a leading research, development and ideation firm for the frozen food industry. Headquartered in Glendale, California, The Perfect Bite Co. is New Water’s second investment in the frozen food manufacturing and ideation space, and its third investment in the value-add specialty food category within the past 18 months. New Water and its affiliates invested in Pegasus Foods, a leading contract manufacturer of frozen appetizers and snacks, in March 2018, and acquired Custom Made Meals, a leading manufacturer of fresh, oven-ready, value-added entrees and appetizers, in April 2017. 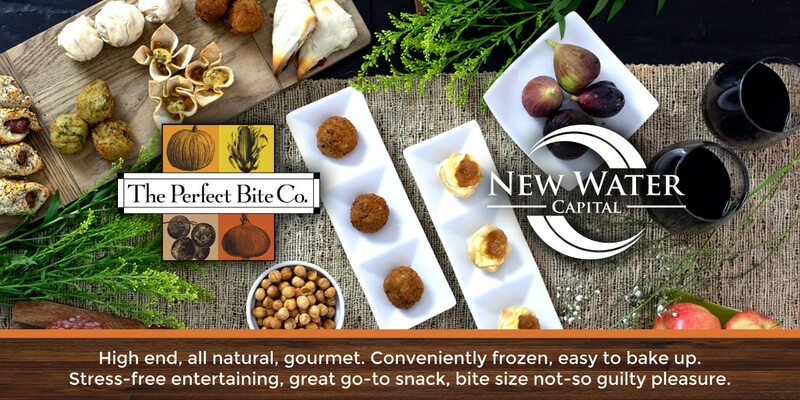 New Water Capital partner Jason Neimark said The Perfect Bite Co.’s continued focus on growing its brand, along with its ability to create innovative, high-quality products to help strengthen its blue chip customers’ private-label products made it an attractive partnership for New Water. Boca Raton, California, Custom Made Meals, Glendale, Jason Neimark, New Water Capital, private equity, Tampa Bay, Teri Valentine, The Perfect Bite Co.